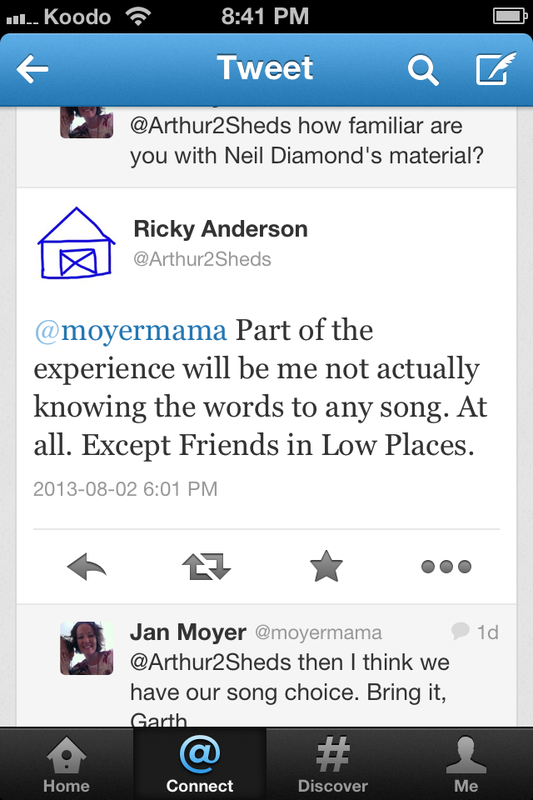 Obviously, I could not pass up this opportunity to hear from a Twitter friend in real-life. July rolled into August and I finally remembered to have my credit card handy when I was at the laptop while the boys were distracted by “Wild Kratts” or “Shawn the Sheep” or something. I ordered the book, now it was time to collect my song. Tweets and emails were exchanged and Ricky had my number. I tried out a few apps to see if I could record the phone call, strictly for posterity’s sake, but realized I would not remember all the necessary steps and thought I’d just record it with the camera or Bearded Husband’s phone. Blackmail Posterity is overrated anyways. All I had to do was wait. Friday night BH and I were having date night at home (a little thing we started to spend more — never mind, you came here to read about the day Ricky called, not date night). I turned to BH as we sat on the couch. Later, when I stopped laughing, I got an email that Ricky would call the next day. He wrote something in Spanish, which I don’t speak (I’m Canadian, we speak English and sometimes French), so when I read “Mañana” I thought he had changed the song to that one by the Muppets. Equally good in my opinion. Easy, Jan, a watched phone never rings. I convinced myself that I just needed to make sure my phone was charged and the call would happen when it happened. Dinnertime arrived. I had five boys to feed on the patio (Neighbour Kid was spending the afternoon with us) and BH was hiding somewhere in the house. We had just recovered from a milk spill and an over application of soya sauce. We thought the toddler was stockpiling basmati rice in his romper then realized it wasn’t rice shaking out of his pant leg, but rather an exploded diaper. Curse you, non-toileting child. Not bad, how was your afternoon? It was my most Lucille Ball-like moment to date. I dashed for the door to get the camera, furtively looked at my phone, weighed the pros and cons of trying to archive this moment. Decided to just play it cool and answer it. I swiped the phone screen. And swiped again. And swiped AGAIN. IT’S GOING TO GO TO VOICEMAIL! Steady, steady, sweaty hands will do that. This call was even more exciting than the time I spoke with Santa. SANTA. “Hi, is this Jan?” said a friendly voice. “Yes, it is.” I replied (I doubt he heard my nervous giggle). And then I heard the most beautiful rendition of “Friends in Low Places” that I will ever hear. It was like an angel singing about beer and whiskey directly from the pearly gates. And Ricky wasn’t chintzy. He sang the entire song. Be still my heart. I thought I’d see him swoop in from a zip line directly into our backyard, for real. We all clapped and cheered (okay, mostly me and the toddler). And Neighbour Kid asked me, “was that a real person?” I know, bud, I know. How could such melodic tones be from a mere human? 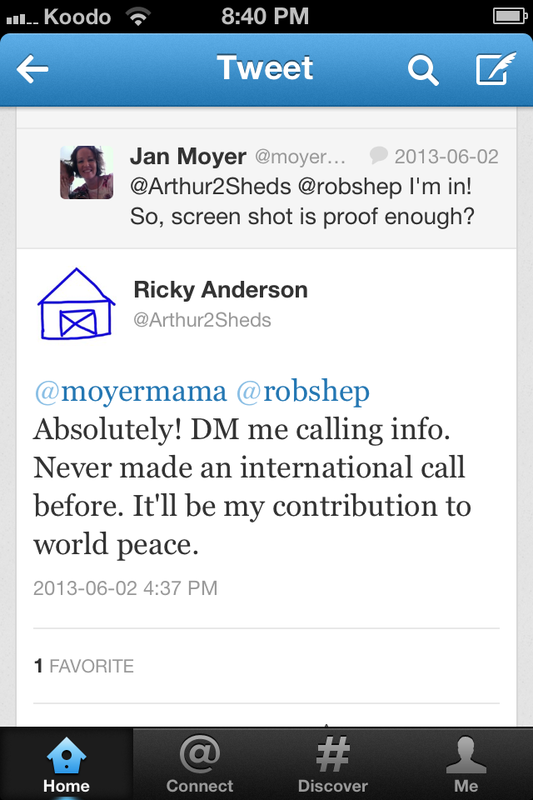 I thanked Ricky for the call and reassured him that I did not record it. I’m sad about that, but maybe some things are better when they live on in your memory. Immediately after I hung up, BH reappeared. And I didn’t care what BH thought he heard. I got my call. And my song. 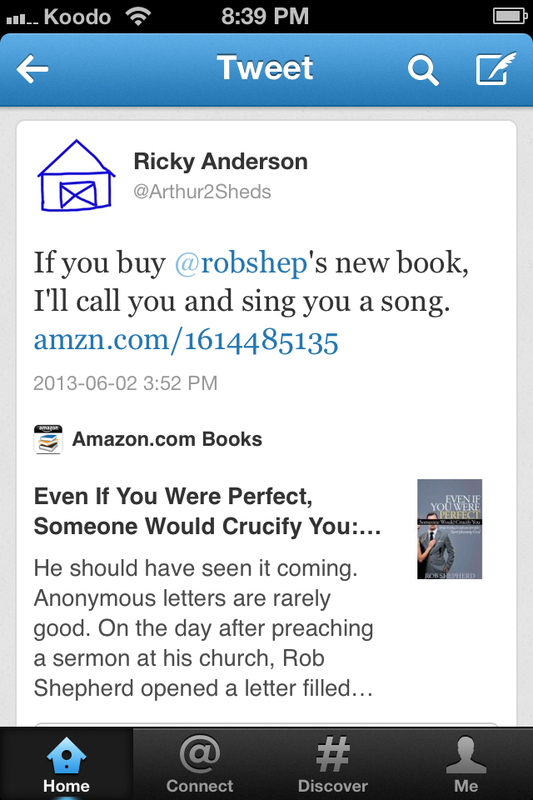 You can find the funny and poignant Ricky Anderson at http://www.rickyanderson.net or follow him on Twitter @Arthur2Sheds. To learn more about Rob Shepherd and his book, just go to http://www.robshep.com and follow him on Twitter, too @robshep. Your turn – are you a peanut or plain M&Ms person? Bo or Luke Duke? Coke or Pepsi?